Funding This work was supported by the Swiss National Science Foundation (SNSF, grants P3SMP3_151740/1142741 to B.E.S. and C.G. ), the Novartis Foundation for Medical-Biological Research, Switzerland (to B.E.S. and C.G.) and the Gottfried und Julia Bangerter-Rhyner Foundation, Switzerland (to B.E.S.). Dr. Tardif holds the Canada Research Chair in translational and personalized medicine and the Pfizer-endowed research chair in atherosclerosis at the Université de Montréal. Background Infusions of apolipoprotein A-I (apoA-I), the major protein component of high-density lipoproteins (HDL), result in aortic valve stenosis (AVS) regression in experimental models. Severe AVS can be complicated by acquired von Willebrand syndrome, a haemorrhagic disorder associated with loss of high-molecular-weight von Willebrand factor (vWF) multimers (HMWM), the latter being a consequence of increased shear stress and enhanced vWF-cleaving protease (ADAMTS-13) activity. Although antithrombotic actions of HDL have been described, its effects on ADAMTS-13 and vWF in AVS are unknown. 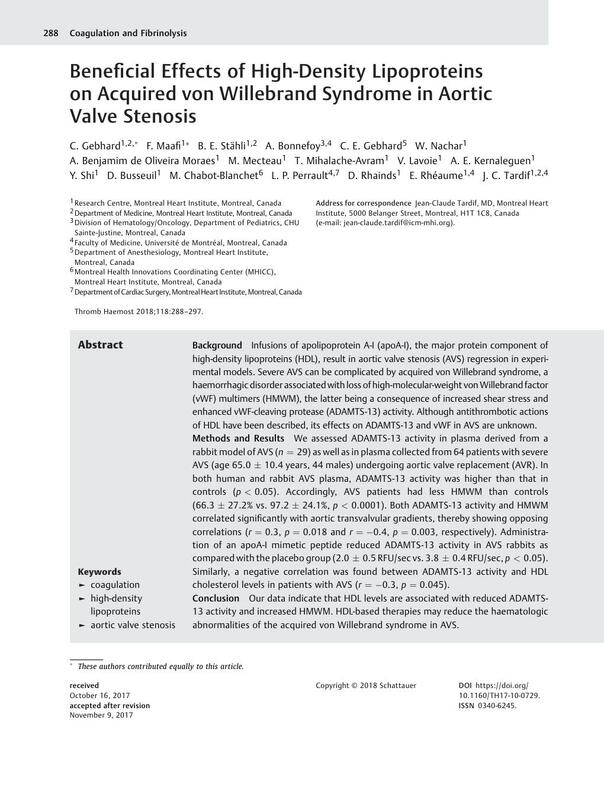 Methods and Results We assessed ADAMTS-13 activity in plasma derived from a rabbit model of AVS (n = 29) as well as in plasma collected from 64 patients with severe AVS (age 65.0 ± 10.4 years, 44 males) undergoing aortic valve replacement (AVR). In both human and rabbit AVS plasma, ADAMTS-13 activity was higher than that in controls (p < 0.05). Accordingly, AVS patients had less HMWM than controls (66.3 ± 27.2% vs. 97.2 ± 24.1%, p < 0.0001). Both ADAMTS-13 activity and HMWM correlated significantly with aortic transvalvular gradients, thereby showing opposing correlations (r = 0.3, p = 0.018 and r = −0.4, p = 0.003, respectively). Administration of an apoA-I mimetic peptide reduced ADAMTS-13 activity in AVS rabbits as compared with the placebo group (2.0 ± 0.5 RFU/sec vs. 3.8 ± 0.4 RFU/sec, p < 0.05). Similarly, a negative correlation was found between ADAMTS-13 activity and HDL cholesterol levels in patients with AVS (r = −0.3, p = 0.045). Conclusion Our data indicate that HDL levels are associated with reduced ADAMTS-13 activity and increased HMWM. HDL-based therapies may reduce the haematologic abnormalities of the acquired von Willebrand syndrome in AVS.